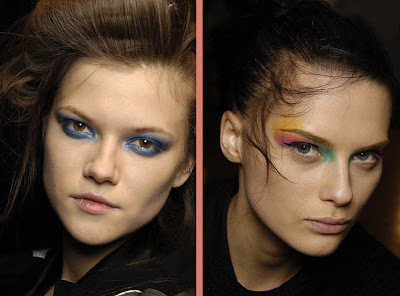 Favorite eyes from Proenza Schouler and Benjamin Cho. I keep a fairly minimal makeup routine; some undereye concealer, powder, blush and a bit of eyeliner. When I go out or feel like sassing it up, I usually play up my eyes, and I have a ridiculous collection of super bright eyeshadows and eyeliners from MAC. It's the only facet of my personal style where I can say I am truly adventurous, so I'm going to be keeping these awesome looks in mind when I get all primped up. I think a trip to Sephora is certainly in order this weekend. Woo!